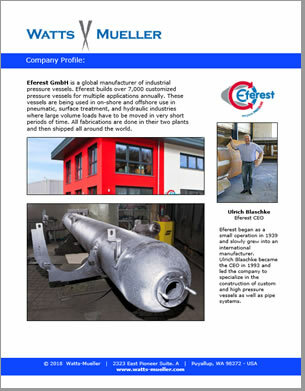 Eferest GmbH is a global manufacturer of industrial pressure vessels. 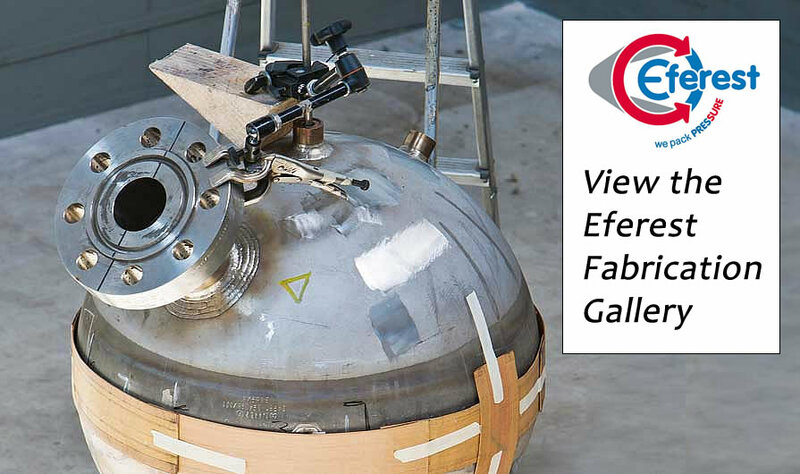 Eferest builds over 7,000 customized pressure vessels for multiple applications annually. These vessels are being used in on-shore and offshore use in pneumatic, surface treatment, and hydraulic industries where large volume loads have to be moved in very short periods of time. All fabrications are done in their two plants and then shipped all around the world. "In 2004," said Ulrich Blaschke, Eferest CEO, "we began to pursue a strategy of consistent modernization and efficiency enhancement in our production. We were building over 7,000 vessels each year and we needed more efficiency without any loss of quality." "We looked at a few robotic cutting machines," continued Blaschke. 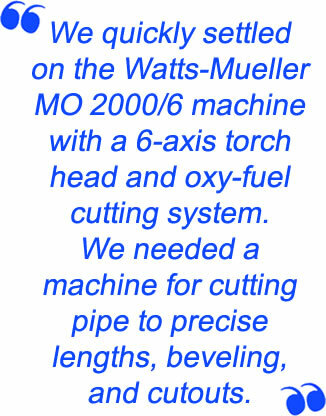 "We quickly settled on the Watts-Mueller MO 2000/6 series with a 6 axis torch head and an oxy-fuel cutting system. 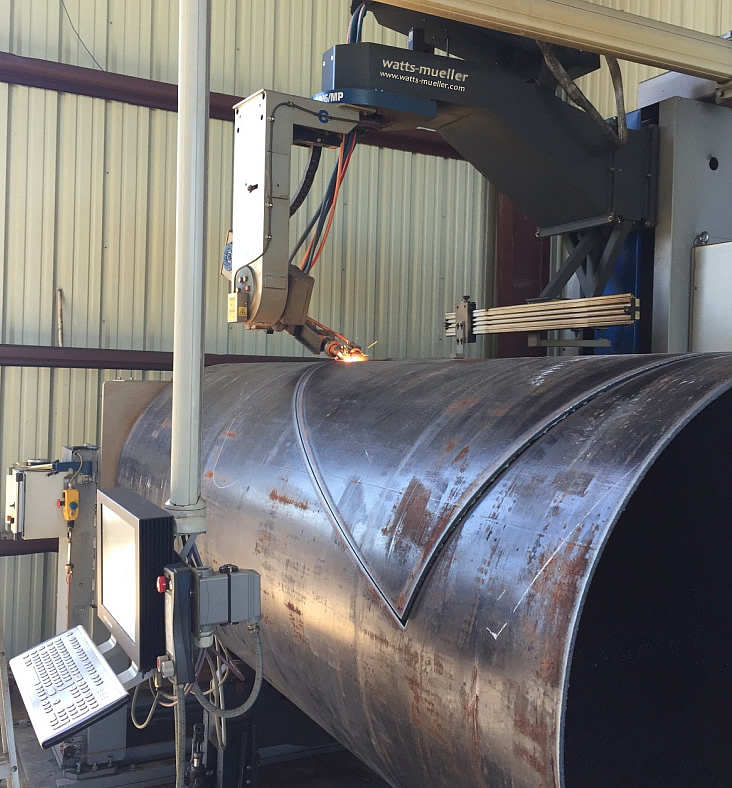 We needed a machine for cutting pipe to precise lengths, beveling, and cutouts." The Watts-Mueller CNC machine is equipped with a marking head that communicates with the machine's measuring system. 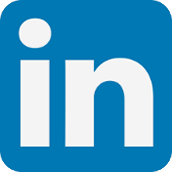 At the machining positions, it can apply lettering and markings as well as assembly markings for subsequent welding on connection pieces. "Because of the extensive software library in the Watts-Mueller CAD software, the machine operator can quickly and reliably program the machine at the computer monitor," Blaschke explains. "This was one of the decisive selling points in favor of Watts-Mueller." Eferest began as a small operation in 1939 and slowly grew into an international manufacturer. 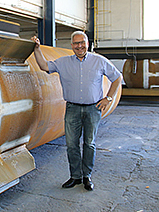 Ulrich Blaschke became the CEO in 1993 and led the company to specialize in the construction of custom and high pressure vessels as well as pipe systems.